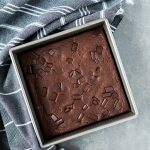 Sometimes I wonder if the very qualities that lend themselves to successful home cooking–adaptability, confidence, being able to think quickly and adjust recipes as needed–are a hindrance to successful baking. In any case, that’s often how I feel. When I cook, I can be spontaneous and adjust a recipe to fit the process and my results. It’s hard to correct a baking error once it’s happened, or to change the direction of a baked recipe once you’ve gotten started. Still, every time I gather up the courage to bake, I’m thrilled I did. 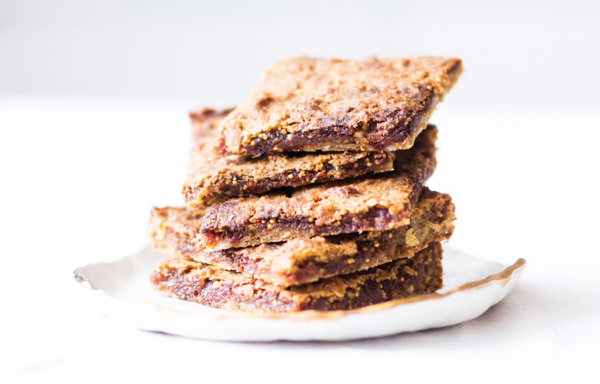 And these vegan fig bars are the latest reminder that baking is really rewarding, in spite of the fact that it’s a more sensitive and scientific process than is cooking. I had two motivations to bake this past week. The first was a desire to get over my fear of baking, with the hope of a a delicious dessert as the proverbial carrot at the end of the stick. The second was the fact that fellow blogger Sarah was in town, and I wanted to offer her a little treat while she was here. She’s an excellent baker, so the bar was set high. But I was determined. And the results were totally worthy. To be exact, these bars are breakfast-worthy, snack worthy, and dessert worthy. They’re so delicious and sweet, and in spite of all the flavor they’re pretty darn healthy, thanks to the use of oats and oat flour as a base for the dough. The fig filling is so good that now I’m dreaming about putting it into muffins, spreading it onto toast, stirring it into warm oatmeal…you get the idea. But first, I’m letting it shine in these delightful fig bars. Pre-heat oven to 350 degrees. Oil an 8-inch square baking pan and dust it with oat flour. Mix the oats, oat flour, cinnamon, salt, baking powder, and sugar together in a large mixing bowl. In a medium bowl, whisk together almond milk, applesauce, vanilla and oil. Add the wet ingredients to the dry ingredients and mix till just combined. Layer half of the oat mixture into your baking pan. Using an inverted spatula or regular spatula, spread all of the fig paste on top. Spread remaining oat mixture on top of the fig paste. Bake the bars for about 35 minutes, or until the top is golden. Transfer the baking dish to a wire cooling rack and allow the bars to cool to room temperature. Cut them into 9 squares. Enjoy! Wrap leftover bars individually and store for up to 4 days in the fridge. You can also wrap bars individually and freeze for up to 3 weeks. I was able to give some of the bars to Sarah in person last night, over dinner, and she loved them. Now I have a few left to savor on my own–as snacks between my classes, as quick breakfast options, or as evening sweet treats. I’m not complaining. And I think that this delightful baking experience is all the motivation I need to try again soon. Oooo – those look delicious! My kiddo has been asking me to come up with a healthy fig newton…. I wonder if these would do the trick for him. Mama Pea really is the best, isn’t she? These look absolutely amazing. I SO appreciate the attention to detail you’ve taken in making them SO good and SO healthy simultaneously. oh my goodness YES YES YES! these look and sound FAB! i love me some figgies! So fun you got to meet MP- knew you two would hit it off! Wow, Gena! What an awesome recipe!!!!! Please, bake for “us” more often! They look amazing and I love how you made fig jam for them, first. And the oat mixture..I could eat crumble or crumbly topping type mixture all day and be in heaven. And oh yes, brandy in the fig recipe? Love it! You really stepped out of your usual for this one and I’m diggin it! I do know what you mean about as a raw cook, measurements are approximate and all the other little factoids you listed. I got a kick out of them. It sounds like you and Mama Pea had a fabulous time together even before the dessert back at your pad. How awesome for you two ladies! What a wonderful tribute and thank-you to her! Thank you for letting us share. I’m going to have to hop over and get to know her in person too–couldn’t ask for a better recommendation. Mmmm…everything about these sounds wonderful. Love Mama Pea, how awesome that you two got to hang out and share baked goods! Those do look great! Thanks for the recipe! Positively delicious sounding. I think what I love too about so many of the recipes, is that many of the same foods/ingredients make an appearance, but in new and wonderfully different ways. I usually can scan the recipe and say, “hey, I’ve got all that”, and a baking/cooking I go. It’s almost quitting time at work. Time to spark up the oven. Oh my, I love figs! These look so good! I’m a huge Pea fan, but I rarely comment, I’m like a closetted pea fan, lol! 🙂 her blog is great! Three letters: OMG. I need those bars in my life immediately. OMG is right! Soooo good! These look so great! I miss Fig newtons since going GF, so I’m excited to make these. These look wonderful! I will have to try them. I haven’t said so yet, but congratulations on your move and your new adventure! Wishing you all the best. PS I’m eating a fig bar right now. Better than any Blossom dessert by a mile! I’m eating gluten-free at the moment (trying to figure out a possible–and what I think is a very likely–intolerance), and I’ve only baked one recipe since making the change! What has discouraged me from trying most gluten-free recipes is the long list of flours that are often combined to make GF baked goods texturally palatable. This recipe, however, is one I’m about to bookmark! Oat flour? I can handle that! And I’ve actually been snacking on dried figs lately, so it would be fun to incorporate them into a new recipe instead of just eating them as-is. Thank you Gena! I’m really excited to bake these! And could Mama Pea be any more gorgeous? I don’t think so. That looks like a fabulous meal with a fabulous dining partner! Maybe you can crack the code on that ginger fizz. That looks so thirst quenching. 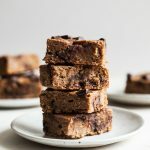 I have had my eye on some raw fig bars in Everyday Raw Desserts. It must be that fig newton from early childhood that we are nostalgic for. B, I’m going to try to replicate it. Meanwhile, tell me how the raw-newton goes! Thanks for sharing your recipe! We are attending an FRG function on Memorial Day, I’m in charge of treats, these are now on the list! 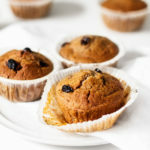 I really enjoy Mama Pea’s blog and her excellent array of recipes. Update: made these for tomorrow and sampled one for breakfast…SO GOOD! I ‘thought’ I had both figs and applesauce and was wrong on both accounts. I did have a bag of dried fruit that included figs (as well as apples, apricots, prunes, cherries) and used those, and pumpkin puree in place of the applesauce. They turned out wonderfully, even my finicky 5 year old gives them two grubby thumbs and a jam streaked face up! You had me at Fig!! These are a must try…Thanks, Gena!! These look amazing- I’m positive they were mama pea-worthy! I think I’m going to need to try them myself, I LOVE figs! Um, YUM! Fig Newtons were one of my favorite mindless snacks back in the day. I say mindless because I could literally eat half the carton without knowing. My how times have changed. An amazing recipe and two beautiful veggie ladies? What could be better? Hi Gena! These look awesome and I send you light and love for your big move. 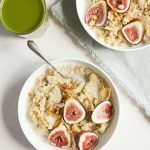 Do you think you could do these with fresh figs at all? Be still my fig-loving heart! Mmmm.must.make.immediately. 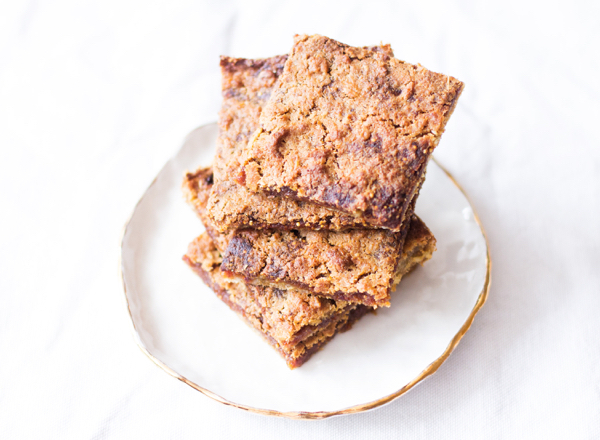 I’m discovering the joys of baked breakfast bars, and your recipe look totally awesome. I love dried figs, but strangely enough I’ve never cooked with them. Thanks for sharing! oh I adore figs and those look absolutely phenomenal! Those sound just amazing! I’m imagining that they are so moist! Yes, you should bake more often. I’m a first-time commenter, but long-time reader. 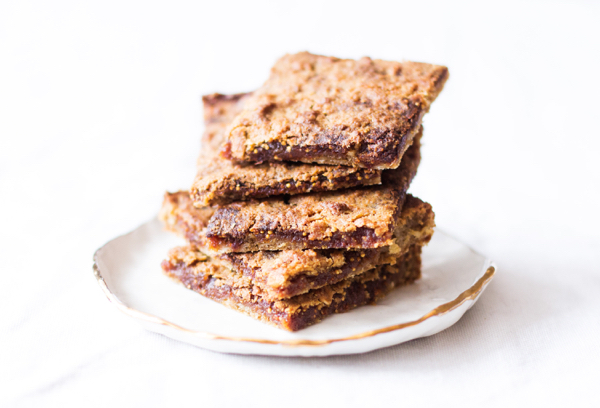 I want to tell you how delicious these fig bars taste! They’re just sweet enough with the fig/date paste, while the oat topping lends a great texture! Love them! I baked these yesterday to bring into the office – they are wonderful! I didn’t have oat flour so I subbed in a mix of almond meal and spelt. It worked well! I keep meaning to tell you, I made this recipe! FYI, I made it into muffins which turned out perfectly after 20 minutes at 350. I also took a shortcut by using TJ’s fig butter instead of making my own fig filling. 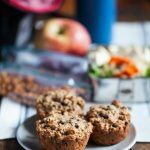 Blasphemy, I know, but the TJ’s version had similar ingredients (and w/o any sketchy additions, thankfully) and it meant I turned these muffins out in no time at all, ready in single servings for me to take with me on teaching days when I need the fuel. Someday I’ll make them again when I have the time for the homemade filling. Gena, just a quick note to say that I made these bars tonight (with the substitution of quinoa flakes and rice flour for the rolled oats and flour, and with the addition of molasses). They were phenomenal. I am really enjoying all your recipes (even though this is from awhile back). Thanks so much! These are in the oven right now….and I am so excited!!! I didn’t read all the comments, but I didn’t throw the figgy water out….I am soaking buckwheat sprouts and more rolled oats (tomorrow’s breakfast)…DELISH!!! Thanks for this recipe…by the way, I’m glad you warned me not to eat all the figgy jam…..can I say…YUM-A-LISH-OUS!!!!!! Thank you so much for this recipe…really…and I’m jealous of where you get to go eat!!!! Peacefood type places don’t exist in Vermont!!! By the by…good luck in school!!! There is a MONSTER-BIG need for nutritionally based physicians in this world!!! I can’t wait til you’re done with all your education…let us know where you set up your practice!!! I am saving that recipe to make soon! I have been looking for a recipe like this for ages. Can’t wait to give them a try! These are currently in the oven, Gena, and they smell fantastic! My omni dad just loves every baked good I make from your site. I would ♥ a raw version of this! these are GENIOUS. I just made them, doubled the recipe, and added in a cup of ground cashews & hemp seeds… and topped with a crumble of coconut oil + oats + coconut flakes during the last few minutes of cooking. I also didn’t have brandy on hand but used aromatic bitters instead and it added a nice “spiced” taste to the filling! do you have recipes for the sushi and the salad? Sadly no, Sandra — that was at a restaurant! Hi, I collected all these ingredients together then noticed in the instructions you mentioned protein powder. There is not a quantity in the ingredient list. How much would you use? I have Rice protein powder in the house. Looking forward to making these. I ended up removing this from the recipe because I found that it was making the results too chalky. But you could definitely add 2 tablespoons to the dry ingredients if you’d like to try it 🙂 Thanks for noting this–I updated the recipe instructions!